Supervision checklists are used during monitoring to verify if an activity has been implemented correctly. 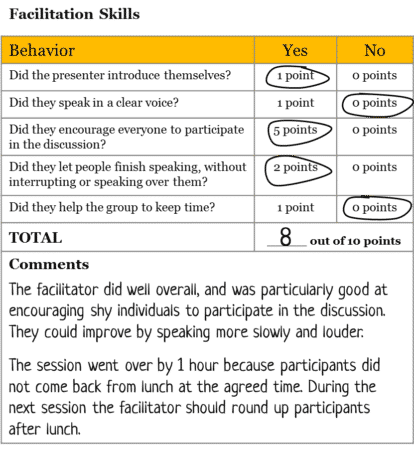 They can also be used to give feedback to the person running the activity to help them improve. Who will be assessed using the checklist? Which activity will be assessed? Who will complete the checklist? How often will it be completed? It’s best to make separate checklists for different types of activities. If you only make one generic checklist for all your activities then the feedback is usually too generic to be useful. Think about the activity you will be supervising. What are the main areas that you need to assess for the activity? For example, if you are assessing a training activity you might want to consider the trainer’s technical knowledge, facilitation skills, general organisation, and the quality of their materials. Try to limit the number of areas to less than 10. More than 10 usually results in a checklist that is too long. 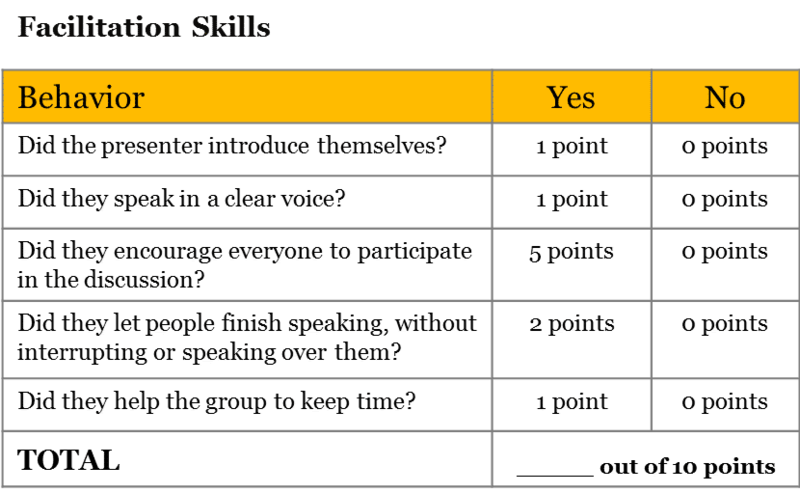 The main assessment areas are normally very general – things like “technical knowledge”, “facilitation skills”, etc. The next step is to list specific behaviours for each area which you can observe. Did the presenter introduce themselves? Did they speak in a clear voice? Did they encourage everyone to participate in the discussion? Did they let people finish speaking, without interrupting or speaking over them? Did they help the group to keep time? Each behaviour should be something specific that the supervisor can observe directly. Try to avoid general or subjective statements like “Were they caring?” or “Were they organised?”. Write the behaviour as a yes/no question where the “yes” answer is positive. For example, “Did they speak in a clear voice?” is better than “Did they speak in an unclear voice?”. Also try to avoid combining multiple behaviours into one question. For example, “Did they follow the agenda and keep time?” should be written as two separate questions, one about the agenda, and one about time keeping. The next step is to decide how many points will be given for each behaviour you have listed. The simplest method is for all Yes answers to get 1 point and all No answers to get 0 points. However, in many cases particular behaviours are more important than others. For example, you might think that encouraging people to participate in the discussion is more important than whether the facilitator introduced themselves. So you could give more points for the participation question. Make a table like the one below showing how many points are assigned to each behaviour. Do this for each assessment area, and leave space for a total score at the bottom. If there are some behaviours that could be not applicable make sure you add an N/A option and show how many points should be scored in that case. There are always some things that are not easily scored, or might not fit into the list of behaviours on the checklist. So it’s important to leave space for comments. 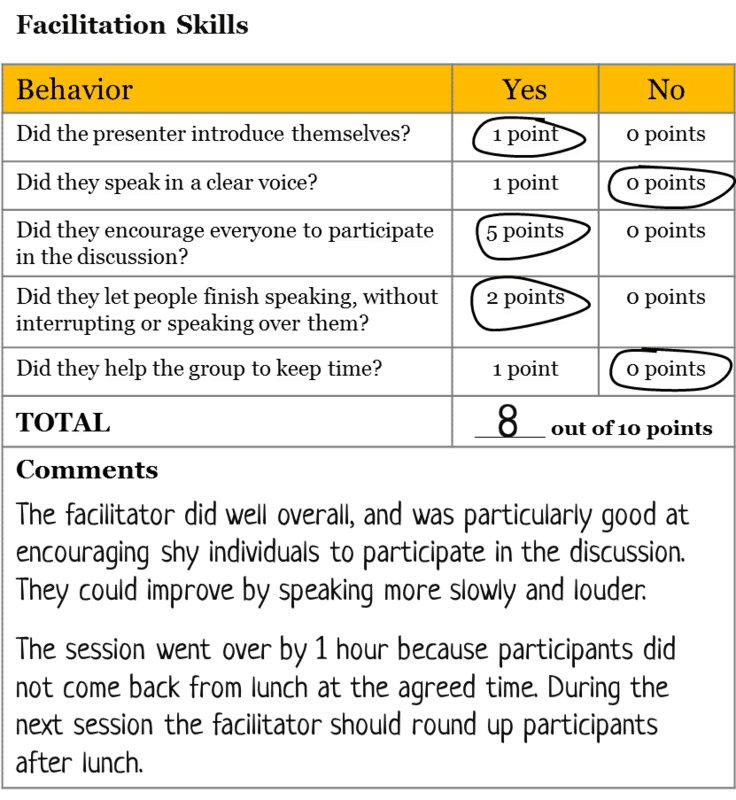 The following example shows how the points and comments can both provide useful feedback to the person implementing the activity. It’s important to test your checklist before you use it. Do this by following the same steps as How to pretest and pilot a survey questionnaire. You may now use the checklist as part of your M&E system.